Haven’t ordered your Christmas Party dress yet? No need to worry, we have the perfect dresses to hire here at Girl Meets Dress! We have various different styles from various designers for all types of occasions! So visit our website and hire a dress of your dreams! This blog will feature some of our favourite dresses to hire for you to wear as your Christmas party dress. Have a black tie Christmas party? Check out these gorgeous gowns! 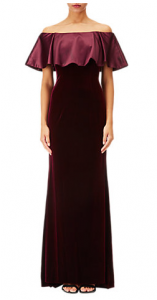 This gorgeous off Shoulder Velvet Dress from Adrianna Papell. It is draped to the floor, this evening piece is made from a soft satin blend. This dress is the perfect Winter colour, a show stopping dress for any event you may have coming up! Do you need to get a Christmas party dress? If so, why not hire a dress from us! Want to feel glamorous at an upcoming party you may have with this sequin gown by Ariella? It’s simple, just hire it! This dress is simply gorgeous. Created from an all over beaded lace,the column skirt is accompanied by an on trend bat wing style top. Hire a dress for your next event! 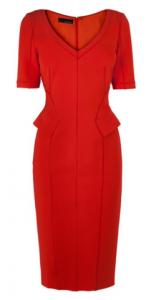 The perfect mid length dress for your Christmas party dress! Dress by Amanda Wakeley. This is such a flattering dress for every figure. With the body-sculpting scuba fabric, the waist-defining peplum and stylish short sleeves. So why not go on our website and hire a dress from us and stand out out in this gorgeous dress! The perfect mini length dress for your Christmas party dress! Hire a dress UK! So you can stand our in this gorgeous black lace dress. This Lace dress by Pearl is long sleeves and has a small collar. It is the perfect Christmas Party Dress! Posted December 13th, 2017 in Uncategorized. Tagged: ADRIANNA PAPELL, Amanda Wakely, Ariella Dresses, black dress, black lace dress, black tie office Christmas party, Brits celebrity dresses, casual office Christmas party, celebrities wearing Amanda Wakeley, celebrity dress hire, christmas cocktails dresses, christmas inspiration, christmas outfit, christmas outfits, Dress Hire, dress hire UK, Dresses, hire adrianna papell, hire Ariella dress, hire dresses in england, hire dresses leeds, hire dresses manchester, hire pearl dress, hire pearl dresses, little black dress, next day delivery, Pearl.